Victoria (Tori) is a 2007 graduate of Bel Rea Institute, Denver CO with an Associates in Applied Animal Science. She has worked at BluePearl Veterinary Partners with in the Internal Medicine Department, as a primary technician since 2007. Medicine Veterinary Technicians, as Small Animal Director at Large. Clinical interest include clinical nutrition and its use in disease management and prevention, feline hyperthyroidism, and acid base disorders. Portrayed by cheerful characters such as Marmaduke, the lovably loyal Great Dane in the comic strip by Brad Anderson, large- and giant-breed dogs are popular companions. 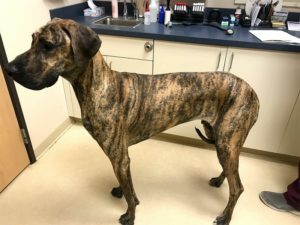 Great Danes, along with dogs of similar stature such as mastiffs, Newfoundlands, Akitas, and Great Pyrenees, are commonly seen in today’s veterinary hospitals. The veterinary team plays an essential role in educating owners of large-breed puppies about the unique needs of these dogs. Dogs that reach an adult weight of >50 lb (23 kg) are considered large breed. While there is no set standard to describe giant breed, the term is generally applied to breeds expected to weigh 100 lb (45 kg) or more as adults. This is not limited to purebred dogs, as many mixes can exceed 100 lb at adult weight. The average growth period for this subset of patients is 12 to 18 months, and they reach maturity between 18 to 24 months, much later than smaller-breed dogs. The period of most rapid growth occurs between 3 and 6 months of age. Cells that control bone growth, known as chondrocytes, first form a cartilage matrix called hyaline cartilage. During birth and growth, this matrix is replaced at the epiphyses and metaphyses of long bones in a process called endochondral ossification. During this time, the skeletal system is highly susceptible to physical, metabolic, and nutritional insults. Until closure of the growth plates, which occurs between 11 and 12 months of age, the veterinary team should recommend avoidance of strenuous physical exercise. FIGURE 1. Lateral forelimb radiograph of a patient with advanced hypertrophic osteodystrophy (HOD) with periosteal bone formation defined by a bony cuff surrounding the metaphysis. In addition to providing a structural frame to which muscles, ligaments, and tendons attach, the skeleton helps protect visceral organs and stores vital minerals that are used in numerous functions throughout the body. Calcium, phosphorus, and magnesium contained in bone are used in coagulation, nerve conduction, and acid–base regulation. Red marrow in the long bones is the pool from which hematopoietic stem cells originate. These cells mature to red blood cells, white blood cells, and platelets. Nutrient imbalances and excesses during growth may lead to developmental orthopedic diseases and subsequent development of osteoarthritis in large- and giant-breed dogs (FIGURE 1). 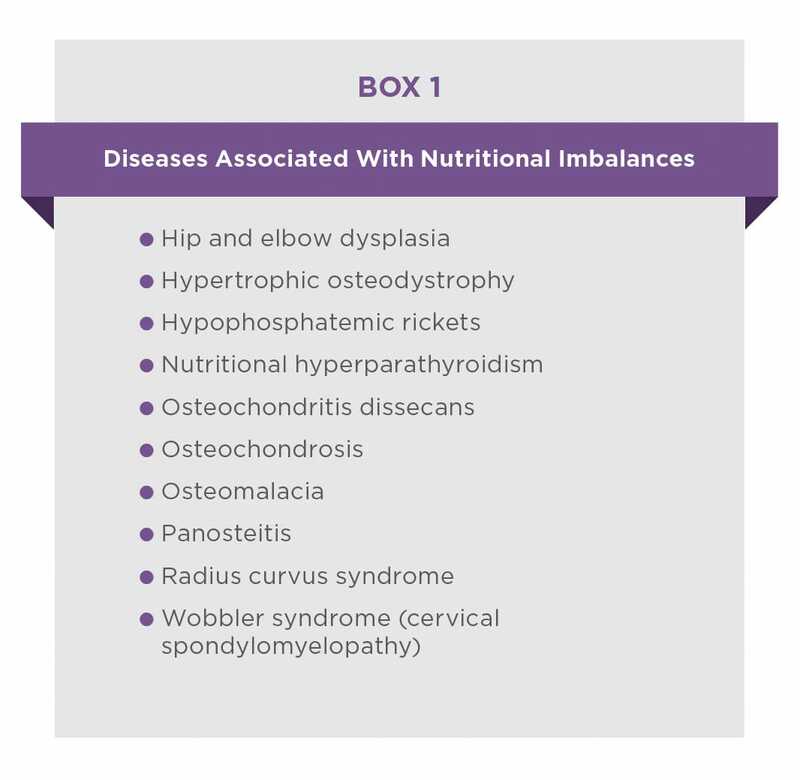 Such diseases include hip and elbow dysplasia, osteochondrosis and osteochondritis dissecans, hypertrophic osteodystrophy, and panosteitis (BOX 1). While the etiologies of these diseases are multifactorial, proper nutrition is paramount to reducing their risk. The terms “large-” or “giant-breed puppy” are not regulated terms per the Association of American Feed Control Officials (AAFCO) and as such may be misleading to consumers. When recommending a diet for a large-breed puppy, it is important to choose one that has undergone feeding trials as established by the AAFCO and is made by a manufacturer that understands the unique nutritional concerns when feeding large-breed puppies. The veterinary team must also understand the nutrients supplied by the diet. The amounts of calcium, phosphorus, vitamin D, and DHA, as well the caloric density, are key nutritional factors to be considered for this subset of patients. The recommended range for dietary calcium in large-breed puppies is 0.8% to 1.2% on a dry matter basis.5 Until 6 months of age, the small intestinal tract passively absorbs 70% of total dietary calcium. Additional supplementation of calcium to a balanced diet (eg, dairy, bone meal, over-the-counter supplements) is therefore contraindicated for puppies during this period, as excess calcium will be absorbed. Excess calcium adversely affects growth and skeletal formation and is associated with developmental orthopedic diseases that include osteochondrosis, pansteatitis, wobbler syndrome (cervical spondylomyelopathy), and radius curvus syndrome. Conversely, feeding unsupplemented home-cooked diets, meat-only diets, or poor-quality diets high in plant-based phytates that bind calcium may result in calcium deficiency, which can lead to nutritional hyperparathyroidism, osteomalacia, and associated pathologic fractures. Dietary calcium and phosphorus are considered together and must be provided in a ratio of 1.1:1 to 2:1 to maintain an appropriate hormonal balance. Relative deficiency in phosphorus, although rare, may occur when excess calcium is supplemented, resulting in widening of growth plates and hypophosphatemic rickets. Vitamin D, a fat-soluble vitamin, plays a vital role in calcium and phosphorus metabolism. 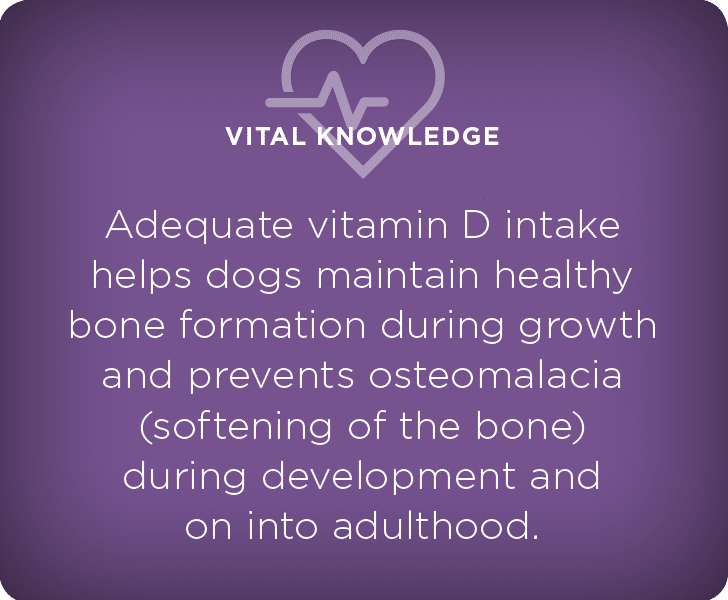 Dogs obtain their vitamin D through diet. After ingestion, vitamin D is transported to the liver, where most of it is stored and converted to 25-hydroxyvitamin D. Later, in response to parathyroid hormone release initiated by low serum calcium or phosphorus concentration, vitamin D is transported to the kidneys to be converted to its active form, calcitriol. Calcitriol increases gastrointestinal absorption of calcium and phosphorus, increases renal tubular reabsorption of calcium, and helps maintain calcium and phosphorus homeostasis. 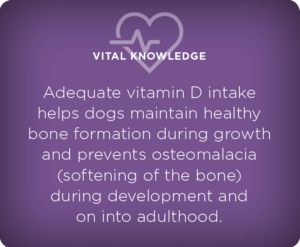 Adequate vitamin D intake helps dogs maintain healthy bone formation during growth and prevents osteomalacia (softening of the bone) during development and on into adulthood. However, when fed in excess, vitamin D may result in radius curvus syndrome. The exact inciting cause for this is unknown. DHA (Docosahexaenoic acid) is an essential long-chain polyunsaturated omega-3 fatty acid crucial to retinal, neural, and auditory development. DHA also improves trainability and learning in puppies.1 Diets should provide DHA ≥0.02% on a dry matter basis. While DHA is an omega-3 fatty acid, not all sources of omega-3 fatty acids contain DHA in acceptable levels. Marine fish supplements are considered ideal sources of DHA and eicosapentaenoic acid (EPA). FIGURE 2. The above image is of a male, castrated, 14-month-old Great Dane with an ideal Body Condition Score (BCS) 4/9. Obesity is an ever-present risk for large-breed dogs, adversely affecting skeletal growth and mobility. Recommended diets should have a caloric density of 3,200 to 4,100 kcal/kg, and puppies should maintain a healthy body condition score (BCS) of 4/9 throughout growth (FIGURE 2). Calorically dense, high-fat diets should be avoided. BCS should be frequently assessed—ideally every 2 to 3 weeks—as an important measure of daily intake to maintain ideal growth rates. Adjustments should be made as needed to sustain the desired body condition throughout the growth period. Meal-restricted feeding has been shown to reduce the frequency of developmental orthopedic disease and early osteoarthritis in large- and giant-breed dogs compared to ad lib feeding2 by preventing the maximal rate of growth and therefore reducing mechanical stress to developing joint cartilage. An exception to the DER for growth is the Great Dane, which has a 25% higher energy requirement in the first 2 months after weaning and may not grow properly if fed <2.5 times RER during that period.1 Another consideration should be made for dogs with long hair, as this subset of patients generally has a lower energy requirement than dogs with shorter hair.3 It should be stressed that underfeeding is considerably safer in these patients than overfeeding. As with all puppies, weaning to a puppy food should begin at 6 to 7 weeks of age. Transition to a large-breed adult food is recommended at 11 to 12 months. 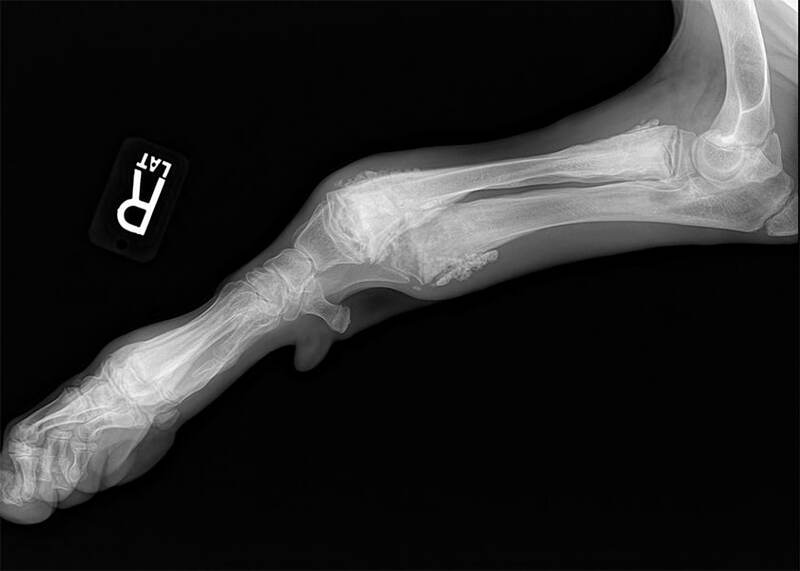 Diet selection and growth rate management are equally critical in preventing developmental orthopedic disease in growing large-breed dogs. It is important that the veterinary team educate the family and take an active role in ensuring the healthy growth of large- and giant-breed puppies to ensure a lasting quality of life for these patients. Debraekeleer J, et al. Macronutrients. In: Hand MS, Thatcher CD, Remillard RL, et al, eds. Small Animal Clinical Nutrition. 5th ed. 2010. (Marceline, MI, Mark Norris Institute):103-104. Lauten S. Nutritional risks to large-breed dogs: from weaning to the geriatric years. Vet Clin Small Anim Pract 2006;36(6):1345-1353. Hazelwinkel H. Nutritional management of orthopedic diseases, Applied Veterinary Clinical Nutrition, 2012. (Hoboken, NJ, John Wiley & Sons, Inc.):125-146. Wortinger, Ann and Kara Burns. Nutrition and Disease Management for Veterinary Technicans and Nurses. 2nd ed. 2015. (Hoboken, NJ, John Wiley & Sons Inc.): 221. Bassert, JM, John Thomas. McCumin’s Clinical Textbook for Veterinary Technicians, E-Book. 8th ed. 2014. (Atlanta, GA, Elsevier Health Sciences): 319.